Ever wanted to make homemade noodles from scratch, but thought it was too hard? Pshaw. You can totally do this. It only takes four ingredients and a bit of your time to have simple and delicious homemade noodles ready for adding to soup or to serve with pasta sauce for a yumtastic meal. Combine the egg, milk, and salt with a whisk. Then stir in the flour a little bit at a time. Keep stirring in the flour until you have a stiff dough. Now, cover this dough with a clean dishtowel and let it rest for ten minutes. Don’t skip this part, it’s very important for rolling the dough. After the dough has rested ten minutes, it’s time to get out your rolling pin. Lightly flour the surface you’re going to be working on. Take the dough out of the bowl and roll it flat. I try to get mine rolled down to a thickness of 1/8″ to 1/4″. Remember, these are going to puff up when they get boiled, so you don’t want to make them too thick to start. After this is rolled out, let the dough rest another 20 minutes. Again, don’t skip this resting part – if you don’t let the dough rest, it won’t stay stretched out when you start cutting noodles. After 20 minutes, it’s time to start cutting noodles. I cut my noodles using a pizza cutter (my noodles are not fancy by any means) but there are many other tools available to help you cut and/or shape your noodles, including a pastry and ravioli cutter wheel, or—even fancier—a pasta maker machine. …but there are some really nifty pasta drying racks that I’ve got my eye on. …they need to dry for at least two hours. Now, it might not look like this is a ton of noodles, but believe it or not, this amount is plenty for the 6 quart pot of chicken noodle soup that I routinely make. I have doubled the recipe before but it always makes more noodles than the broth can handle. Experiment with the amounts of noodles that your family needs. It’s easy enough to double, triple or multiply this recipe by even more if it is needed. After the noodles have air-dried for two hours you have two choices: you can package them up in an airtight container (to store in the refrigerator for a few days), or you can cook them. To cook, add them to a pot of boiling water or—as I almost always do—a pot of chicken soup. Let them boil 10-12 minutes and voila! You’ve got yourself some simple, delicious, and oh-so-much-better-than-store-bought homemade noodles ready to make your belly happy. With only four ingredients and a little bit of time, you can have your own homemade noodles from scratch. 1. Combine the egg, milk, and salt with a whisk. 2. Stir in the flour a little bit at a time. Keep stirring in the flour until you have a stiff dough. 3. Cover the dough with a clean dishtowel and let it rest for 10 minutes. 4. After the dough has rested ten minutes, it’s time to get out your rolling pin. Lightly flour the surface you’re going to be working on. Roll the dough flat (1/4" -1/8" thickness). 5. Let the dough rest another 20 minutes. 6. Cut your noodles into strips; I use a pizza cutter. 7. Lay your noodles out to dry (I use a cooling rack) and let them dry for at least 2 hours. 9. Cook them. Add them to a pot of boiling water or chicken soup for 10-12 minutes. I tried making noodles several years ago and they came out too thick. After reading your excellent instructions I think I know where I went wrong. I didn’t let them rest after I rolled the dough. I’m ready to try again with your tips and hope it will work better. Thank you! My Mother Inlaw only used the egg yolks to make noodles, she used the egg whites to make Angel food cakes. She was a really good cook. She was an incredible woman. After you have dried them how can you store them. Airtight container… anything else? Just in the pantry? Or do they need to be refrigerated? You can freeze them in freezer bags..
dry them good and freeze them on a cookie sheet then but them in a freezer bag,,but do not thaw them out before you cook them,Cook them frozen. These uncooked noodles have a raw egg in them. Do NOT store them in a pantry. Freeze them if you are going to keep them more than a day or so enforce you cook them. If you are going to dry them dry them leave them on the rack for at least 24 to 48 hrs. then you can put them into either zip bags or glass or plastic container. I have wanted to try putting them in vac bags but haven’t tried yet so not sure if they would hold up dried in there or not. You can also put them in a food dehydrator if you have one. You can also freeze them on trays flat or else twirl them into nests with a fork then put in freezer until frozen, I usually do over night, or 24 hours but may not really take that long, then put into zip bags or vacuum bags and put back in freezer. With frozen take out and put as many as you need into broth or water just like fresh and cook as usual. The frozen may take a few extra minutes due to temperature and the recovery time of the broth. I enjoy cooking and the recipes are Great. In order to store them you say to just put them into an airtight container. Then refrigerate them? How long will they keep? Can they be frozen? You can refrigerate them for a few days. I’ve never frozen them so I’m not sure. I have not had luck just keeping them in the pantry. Can you make these noodles with alternative flour, like chickpea flour? I’ve made these with both white and wheat flour, but never tried with another. If you try, can you let me know how it works? Do you use all purpose or self rising flour ? All purpose. I’ve had luck with both white and wheat. I am assuming you mean an ordinary container with lid that will keep the air out. Also I would like to know how long you can store them and do you need to refrigerate or freeze them since there is egg and milk involved? Refrigerate for a few days. I’ve not had luck storing them in the pantry, I don’t think these noodles get dry enough air drying on the counter to store any other way than the fridge. I’m lucky enough to have an atlas 150. Using this recipe they turned out great. You cant beat home made pasta. I am DEF going to try this noodle recipe. I bought a pasta maker and have used it quite a bit. I make a triple batch and use my portable clothes dryer to dry the noodles. The recipe I’ve always used uses 6 eggs…..so I’m hoping that this recipe is a winner. My mom would roll the dough out thin. After the dough rested, she would sprinkle flour on it and roll it back up. After the dough was rolled up, she cut thin circles from the end and fluffed the noodles out after the roll had been cut and let them dry. Mine did too. Every female in my family knows how to make homemade noodles. You can also toss them into the pot when pot roast is near done. Our family recipe is German or weekend. We have never used any liquid…flour, eggs and seasoning. Yum! How do you store them if you want to make thrm ahead? Freeze? I’ve not frozen them myself, but there is a comment from a reader above that says you can freeze them in bags. It’s worth a try! Do you use all purpose flour or self rising? I have frozen homemade noodles for future use. Much like you can find frozen in the refrigerated section. To expensive at the store, when we can make them for pennies at home. I also fortify my five pound bag of unbleached flour with one cup of raw wheat germ, raw wheat bran and 1 cup of whole wheat flour. Its delicious and more nutritious and still looks white an most people don’t know the difference. A good way to introduce your family to multigrain flour products when they are used to only white bleached flour. I get these add grains from walmart which is Red Mills brand. I order on line and have it shipped. This is the recipe I use…..Works great!! 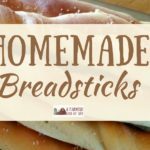 There’s nothing like “homemade!” Always enjoy reading your posts! This is basically the.way my mother made noodles. I make them the way she did. She let the dough rest like this. The only difference is she dusted the surface with flour, rolled the dough like a jelly roll then cut it into strips with a sharp knife. She would then give each strip.a little stretch and lay.them out to dry. She left them to dry overnight. When she dropped them in the pot the next day,.the bit of flour that clung to each noodle thickened the homemade chicken broth and made a perfect sauce. Her noodlrs were the main thing our family looked forward to for holidays. My own family enjoys the ones I make but I never think they are as good as Mom’s. My family had been making noodles all my life and I’m 62. It’s what we all look forward to on the holidays . We roll the dough up like a jelly roll then cut into strips. Wonderful!! I had forgotten how easy ind good these are. Thanks for the reminder! I dehydrate my noodles all the time. Works great clears the count off sooner for the next project. Thank you for the post. Could you use this recipe for spaghetti noodles? Not sure…but definitely worth a try! Remember helping my grandmother make noodles many years ago. She has been gone for over 50 years, but I still have the memories and the love of homemade noodles. I make them on occasion and enjoy the memories & time we had together. Also learned how to bake bread from her & it is something I do 2-3 times a week. If your making extra , you said air tight container but do you refrigerate? Remember when we all had our coffee cups on the little tree stand? I now use that little stand to drape my noodles over when drying. The posts that the cups used to hang on are about 1/2 inch think which gives the noodles space to dry and they won’t stick together when hanging on there. My cups are now in the cupboard. I Love the farmish kind of life! Fresh noodles are faster cooking, than store bought. Isn’t that a long cooking time(10 to 12 minutes)? I’ve been making noodles for years. Love the way they thicken the soups they are added too. I let mine rest about a half hour before i cut them, and i roll them up then cut them then unroll them. I only use the Egg yellows. You mean the yolks. Are you yoking? Ha ha, couldn’t resist. This is our favorite family recipe. I roll them out and then roll them up and slice them about 1 ” thick. Then unroll them and put them in boiling broth with Poultry Seasoning in it. I have never dried them and never been able to make enough for everyone to be satisfied at one time. They love them! My grandma made noodles for her Pennsylvania Dutch chicken pot soup. She would cut in wide strips then over the rolling boil of the pot she would get the scissors and cut one inch squares into it. She made sure there was some flour on the noodles…just from the baseboard, and it would thicken. OMG….when I make this recipe, even my dog is excited. My mother-in-law taught me to make noodles. After cutting the noodles, she let them dry for a while and then put them in a paper bag with about half a cup of flour. She would shake the bag to distribute the flour to help absorb the moisture and keep the sack in the fridge until ready to cook. She would shake off the excess flour using a strainer before cooking. I am wondering if there is a way to use gf all purpose flour? Any thoughts? Our church circle makes gf noodles we use the same recipe as for regular flour . We have had no complaints on them. And we let both kind dry completely before storing or cooking. Hope this helps. Can you use this recipe to make lasagna noodles? If so, after drying them, can you put them right into the lasagna recipe and bake? That, my friend, is a great question. I’ve only ever used this for noodles that boil in soup. If you try using this recipe for lasagna noodles, can you let us know how it works? I have never used milk in my noodles. Just egg, water and flour – Roll them thin, then slice however you wish and place in your lasagna dish. I have never dried before making fresh either, but each person has a personal preference. Found they give lasagna just that little extra touch. You can also substitute the water with any liquid, ie; spinach juice, beet juice, carrot juice for a different color. I have made large batches, dried on a rack and kept in the freezer. You can buy manual pasta machines for rolling out the dough and slicing. I have one and I use It for perogy and ravioli dough, and numerous others. A favorite is make your noodles and drain. In a deep pan, saute some fresh bread cubes, until golden, in some butter then stir in your noodles, add a pinch of salt and pepper. If you are rolling pin challenged, like me, try flattening your dough out using a tortilla press and wax paper. This gets them really uniformly flat. MY RECIPE IS FROM MY GRANDMOTHER AND CONSISTS OF 4 EGGS, FLOUR TO MANAGE AND SALT AND PEPPER. ROLL OUT THIN, LET DRY A FEW HOURS, THE ROLL UP BEING SURE TO ADD SPRINKLES OF FLOUR SO DOUGH DOESN’T STICK TO ITSELF. CUT WHAT EVER WIDTH U NEED WITH A SHARP KNIFE.. UN ROLL AND ADD TO CHICKEN BROTH FROM YOU RECENTLY PARBOILED CHICKEN. COOK UNTIL TENDER. I NEVER HAVE LEFTOVERS…. I grew up with homemade noodles. The recipe was egg and flour. She sprinkled abit of flour on the kitchen table and sometimes just a dusting of flour on the dough as she was rolling or a bit on the rolling pin. Mom rolled the dough out very thin, rolled it up like a jelly roll and sliced it. Then she picked up the sliced rolls, shaking them gently to loosen the rolls, and let dry overnight to dry. She spread a clean newspaper on the kitchen table for the drying. Made great noodles. There are many ways to make homemade noodles, and they are so good. If we kids tried to snitch a noodle when she was slicing, we got our hand popped with the dull side of the cutting knife. my recipe uses water not milk but the same otherwise, I drop mine right into boiling soup, but they can be dried. My son adds fresh cracked pepper when he makes them. Can these noodle be dried in a dehydrator? So that they can be kept longer? I’m just wondering because It seems like you should be able to. Any chance you want to share your chicken soup recipe? my daughter made this yesterday and let them dry. after she cut them she put them in a Ziploc baggie and left on the kitchen counter. Is it safe to cook them for dinner tonight? or should we not? 2 eggs for every cup of flour. Egg per person. Remember to add salt. Roll out to desired thickness on floured surface. Sprinkle good w/ flour . Roll up. Slice with sharp knife. Unroll. Noodles !! Or you can cut with a noodle cutter. 1 tablespoon of water per egg, 1/4 t cream of tartar (for a fluffier noodle) Add flour till desired dough is formed. I’ve dried them completely and/or cut and boiled. I don’t add salt because that lengthens the drying time. My mom and I have used this recipe for over 70 years. Never failed to draw rave reviews and we always cooked them with chicken and broth, and served over mashed potatoes. Yum! Yum! your recipe is my go to! i always make noodles for our spaghetti. it is way easier then packing the kids in the car to run to the store and taste much better. this one is great because the kids can help and i dont have to worry about them messing it up. i do triple the recipe for our family of 5. Do you at this time, have a plain old recipe for Dumplings, the large ones that you spoon on top of soups? I do not. 🙁 That’s actually not anything I’ve ever made. Sounds like I’ll have to tackle it! How many does this feed? Thanks for the post! Do you think this can be made with almond flour or somehow low carb? Ah, I’ve been wanting to learn to make homemade noodles for a while. Though I have known that they are pretty easy to make, I have never gotten around to it. I will definitely be giving these a try soon! My husband’s grandmother made something SHE called “dumplings”, which were like noodles that where NOT rolled out thin. My family, from further north, called “dumplings” bread balls that were dropped on top of bubbling stew, and puffed up as they rose; Mom made them from Bisquick.